The following guest post is from Amanda Morgan of Not Just Cute. Parents and teachers are notoriously good problem-solvers. It makes sense, as they get so much practice! When problems arise, kids bicker, or decisions need to be made we are quick to get things back in order. It's often a tool of survival -- or at the very least, a matter of preserving our sanity. But what if we got a little less practice, and let our kids get a little bit more? I'm confident we'd still be able to maintain our own problem-solving prowess, and hopefully our kids would develop a bit of their own. Let me give an example of what that difference might look like. Not too long ago, I came upon two boys in a play group. They were playing in a play structure, or more accurately, they were arguing in a play structure. Each had his own idea of what imaginary form it would take on and how the play would follow. Was it a train or a dojo? Tough questions for a pair of preschoolers. Each glared as he tried to push the other out. Next attempt, the grown up usually jumps in with a solution. Perhaps suggesting the boys take turns. "You play first. Then when the timer goes off, you trade." There's nothing inherently wrong with either approach, and sometimes it's the route you have to take to smooth things out. But both approaches put the adult in the driver's seat and pits the children against each other. "I win. You lose." When I came upon the scene, I thought it was a perfect opportunity to engage the boys in some proactive problem solving, giving them some practice and putting them in a more cooperative position. I let each child tell me what was happening. What did he want to play? Why didn't he want to go along with the other idea? With the problem defined ("I don't want to play in a train and he doesn't want to play in a dojo!") I encouraged each child to offer some ideas. This is usually the part that takes the most practice. Not just to come up with ideas, but to wait your turn, listen, and offer your opinion politely rather than dissolving into a puddle when you don't like what you hear. I often remind children, "Right now we're just talking about ideas," so they can learn to separate the ideas from our plan of action. The two boys offered up ideas. Could it be a motorcycle? Of course not. Maybe a jet? Not a chance. Suddenly, they agreed that it could be a snowmobile with ninjas on board. (A solution I never could have come up with myself, by the way.) Both agreed enthusiastically and launched into play. I stepped back and observed. The two boys who were shouting at each other with furrowed brows were playing and getting along fantastically. In this step, I could see that things were going well, so I didn't want to interrupt the play. I simply commented to them that it looked like they were having so much fun together. Later, when the play concluded, I briefly talked them through the process they had gone through and commended them again for coming up with a solution. It was just a play plan, nothing spectacular. (Though ninjas on a snowmobile are rather spectacular.) But hopefully this opportunity to own the conflict and resolve it cooperatively will yield impressive dividends as they each build the skills needed to be active problem-solvers. 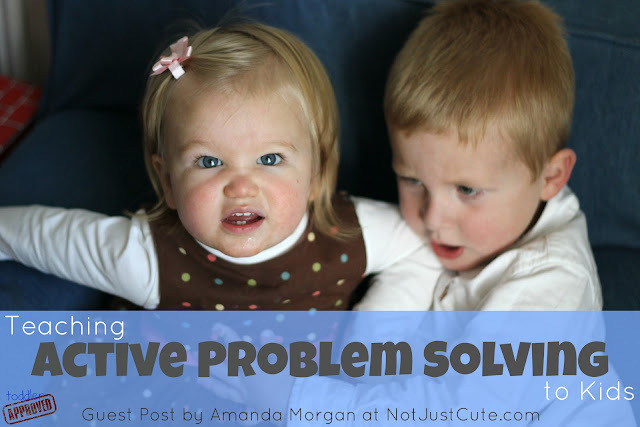 **** Want to learn more about teaching active problem solving to kids? Head on over and sign up for Amanda Morgan's Parenting with Positive Guidance: Tools for Building Discipline from the Inside Out. Course registration closes on September 12th, so don't wait! Learning to teach active problem solving skills is just one of many of the skills that you'll acquire as you take this course! PS- Have you entered our My Angel Said What? Giveaway yet? The giveaway closes on September 11th, so don't miss out! good tips! definitely need these for my two boys!! thanks! Yes! And when there are two spidermans playing in the same room? 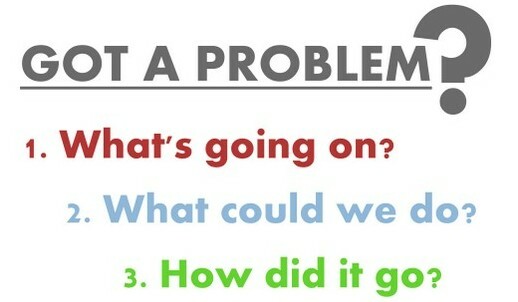 That´s real trouble! I love this post. I work with very young children so they don´t verbalize as much, but they express themselves very clearly. I try to describe the situation avoiding any judgment, remembering it´s not that red car they are struggling for. What they really want is to learn how to become friends, and they do it quite well if given enough time to work out their problems by themselves. I´ve noticed that children who are already attending daycare centers tend to look at me when they are in trouble with a friend as if they already got that message: "the big adult is the one in control who brings all solutions for you". Interesting?